Launching your boat into the ocean either down the beach or a slipway can be hard work without functioning boat launching wheels. Installing wheels to an inflatable boat is fairly simple with just a few bolts through the transom. The best boat launching wheels is the Seamax Deluxe 4, which is suited for a range of inflatable and aluminium boat to offer easy maneuvering. Adding wheels will not only add value to your boat but reduces the hassle of carrying it around when it is out of the water. Instead of requiring a few other people to move the boat, with high quality launching wheels, you are are able to move it by yourself. The idea of boat transom launching wheels is that they fold down to help moving the boat when it is out the ocean. If you leave them down when in the ocean, you will feel a drag that results in a lack of speed on the waters. For this reason alone, its essential that the mechanism is easy to use and lightweight for folding. Many inflatable boats designed for the ocean will come with the mounting points for the launching wheels. This will make installing boat wheels a simple and direct modification that will add value to your boat. Adding wheels to your boat provides so many benefits that make them highly desirable. Below is a list of the best boat launching wheels that attach to your transom to make boat movement much easier. Seamax are a reputable marine brand that provide premium products on a large scale. The launching wheel construction is made from T6 aluminium alloy with CNC processing so that it can withstand extreme weather for long periods. All smaller parts are made from stainless steel that ensures the launching wheels are safe to use in saltwater. The all terrain 12″ tires are tested up to 1,000 LBS and the wheels will easily support a maximum load weight of 600 LBS, which is perfect for the majority of inflatable, aluminium and fiberglass boats. There is 4 different lengths at which you can have the wheel set at with a range of 23 to 30 inches. In terms of folding the wheels up, there is a 60 or 90 degree locking position angle, which is ideal in most situations. Overall, the Sea Max Deluxe 4 is the best boat launching wheels with everything you require for maneuvering easily. From adjustable and removable legs to an aluminium and stainless steel construction that is suitable for saltwater, it has it all. The only drawback is that it is slightly pricey to purchase but it is certainly a worthwhile investment and it comes with 2 years warranty for piece of mind. The Brocraft is a marine grade aluminum construction with pressurized wheel that are 12 inches in diameter with a weight capacity of 500 LBS. The wheels simply lock up using a stainless steel button to operate the folding mechanism. 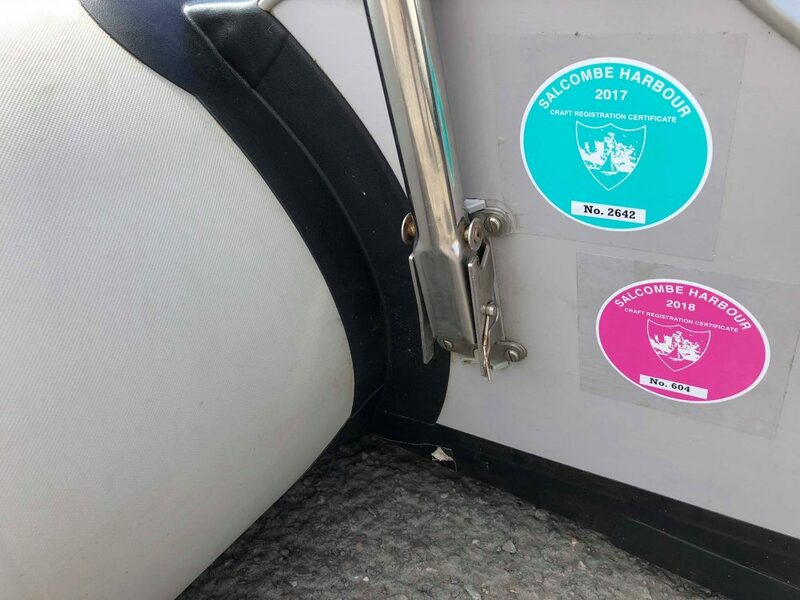 Installation of the Brocraft boat wheel is very simple with just two brackets that require connecting to the transom. Once they are bolted down with the hardware included, the legs simply attached directly for a hassle free installation. Overall, the Brocraft launching wheels are a great alternative to the Seamax at a much cheaper cost. With aluminium and stainless steel construction with all terrain 12 inch wheels, it is very similar to the Seamax apart from the cheaper cost. There are a few features the Seamax does better but for boat owners looking for the best on a smaller budget, the Brocraft wheels are ideal. Reducing the costs even further by ditching the aluminium and stainless steel hardware and using durable plastic is another alternative. Norestar have developed these wheels that can hold up to 440 LBS and boats up to 12 foot. They are extremely lightweight and makes folding them up and down much easier than the heavy duty launching wheels above. Due to the smaller wheels, these won’t be easy to pull around in the sand but for almost all other situations, it is just as good as the larger 10 to 12 inch wheels. 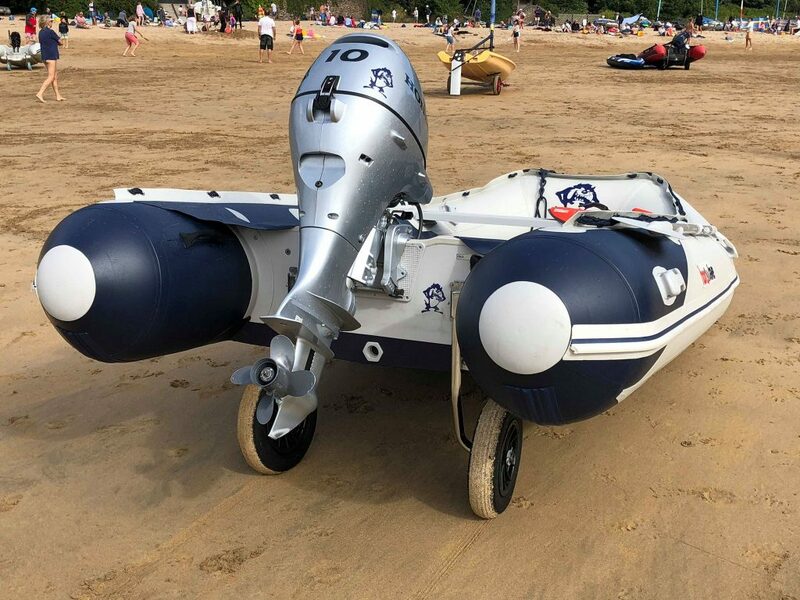 For inflatable dinghy owners that want a something lightweight and don’t plan on dragging the boat through sand, these are the best small launching wheels for boats available. The reasonable cost and simplicity of the installation make them very popular across the boating community. Saturn are a reputable brand in the marine space and have developed budget launching wheels for boats that are constructed with heavy-duty marine grade anodized aluminum for maximum durability. The 12 inches wheels are 3 inches wide and are all terrain including sand. When not in use, the wheels simply swivel up and lock into position. The maximum load weight stated by Saturn for these wheels is 300 LBS, which is fairly low but so is the price. Overall, they are the cheapest boat launching wheels made from aluminum and comes with excellent 12 inch wheels. For those that don’t you the boat that much but simply want a cheap option, the Saturn wheel are ideal. The stainless steel boat launching wheels use 10 inch foam wheels and a stainless steel construction to produce a heavy duty setup. The max weight is only 300 LBS, which is on the low side but it will be perfect for the majority of inflatable boats. When the wheels are not in use, they simply folds upwards and can then be locked into place using the stainless steel lock. Overall, the BRIS Boat Transom Launching Wheels are excellent all rounders and offer everything you want from the wheels. However, there are many that offer more features and cheaper but if the smaller foam wheels are meet your requirements, then these are ideal. Dragging an inflatable boat without wheels can be very hard and made virtually impossible when there is no one around to help out. Simply by adding some boat launching wheels to the transom of the boat will transform the way you move the boat around. Clearly, launching wheel are only for inflatable, fiber glass or small boat. You will not be able to simply install wheel to the back of a large vessel and move it around with ease, this will require a trailer of some sort. There is a range of choices in terms of launching wheels but there are some factors to consider. The average wheel size is between 10 and 12 inches with a diameter between 2 and 3 inches. This wheel and tire size combination is ideal for cutting through the sand using all terrain tires. There are other alternatives that are cheaper and have smaller wheels. This is fine for moving around the boat yard or on solid surfaces but it makes maneuvering the inflatable boat on the sand a nightmare. A cost cutting exercise by many manufacturers of the cheap examples will use standard rubber tires. Paying the extra for all terrain tires is highly advisable to ensure easy movement no matter the rolling surface. Many inflatable boat manufacturers will leave cut outs or marking for the bolts and brackets. 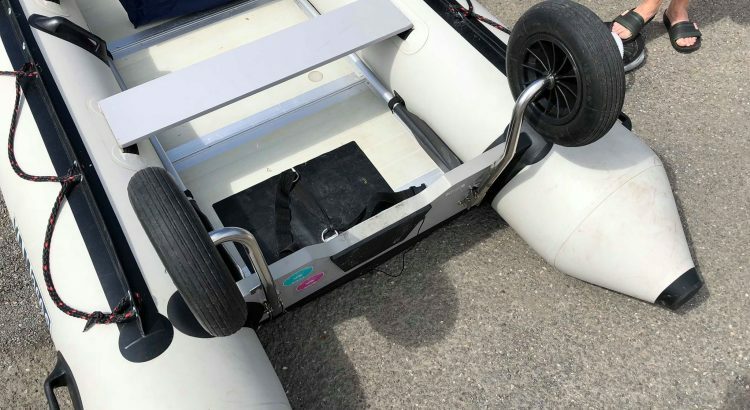 If there is no indication of any marking, you will need to carry out a few measurements and ensure the wheels are wide enough a part and have enough height so that the small outboard motor is not catching on the floor. Once the measurements have been noted, it is simply the case of drilling 2 or 4 bolts and attaching the brackets. You will then be able to slide the legs and connect the wheels. It is advised to oil up the folding mechanism and test it works as you do not want to lose one of the launching wheels in the ocean. If you are yet to purchase launching wheel for your boat, now is the time to do it. They have the potential to be the best accessory you have ever bought for your boat and any of the alternatives will provide the ease of movement. Budget plays a big part in terms of the quality but personally, the Seamax and Brolift are the clear winners with the larger wheels and heavy duty construction. Although it is quite clear but launching wheels must not be used for towing purposes as they have not been designed for this. Heavy duty boat trailer tires are what is required due to the structure of the rubber. It is common sense but many boat owners are guilty of doing towing using the wrong wheel.